I have a serious case of OCPD. Obsessive Complusive Packing Disorder. It's a real disorder. Go look it up. I'll wait. Ok... maybe it's not, but you actually believed me there for a minute huh!?! 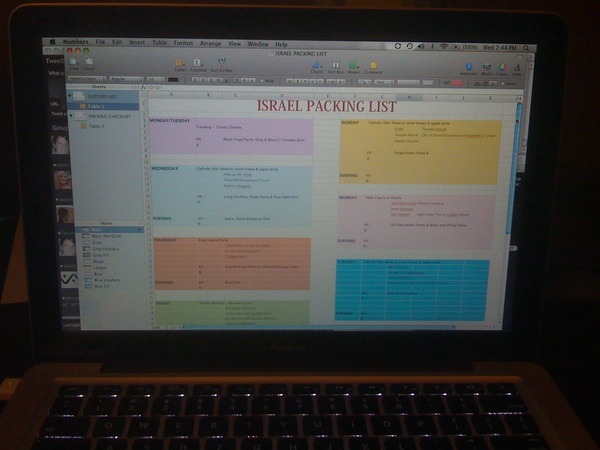 We leave for our trip to Israel in 3 days, and I have begun the packing process. Yes, it's a process. I do not believe in throwing things in a suitcase the night before. I do not believe in just grabbing whatever clothes out of the closet. It's important. It's planned out. It's the curse of the planner within me. Last night, my husband went to play basketball like he does every Tuesday and left me home with my spreadsheets and suitcases. Wow, I had a blast. Before I knew it, three hours had gone by and I was wide awake and in a great mood. See...it's a disorder I tell you. Along with preparing our suitcases, we're preparing our hearts and minds for this trip. It's going to be a life-changing one. I'm excited to see the bible unfold before me. I can't wait to see the stories I've learned literally jump off the page and become real. Please follow along with our trip as we'll be blogging about it the whole way! What kind of a packer are you?